If you have a warm-season lawn, the cooler months ahead will soon turn that lawn dormant. The good news is that there’s an easy fix that will have your lawn green, full and fluffy through the fall, winter and spring months ahead. Overseed your lawn with Annual Ryegrass. Fall is the time to overseed your warm-season grasses such as St. Augustine or Bermuda. Warm soil, cooler air, and fewer weeds as competition all add up to the perfect time to overseed. Not only that, but the diseases that usually attack grass seedlings are much less active in the fall. 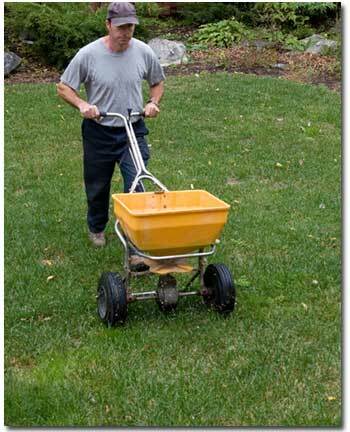 In preparation for overseeding, you need to mow your lawn a little lower (shorter) than usual. Make sure you remove all the clippings, too; this allows the new seed application to get to the soil more easily. You may also need to aerate your lawn if you haven’t done this recently. Aerating allows the water and nutrients to penetrate deeper into the root system and allows your lawn to breath! Amending your soil is simply adding a thin layer of fertilizer-enriched soil to what’s already there. Rake in less than a quarter of an inch; more may kill your lawn. Kellogg® Topper is perfect for this purpose. The enriched soil gives your new seed more of a chance to grow and thrive. You need to choose the right seed for your overseeding project. Grangetto’s recommends overseeding warm-season lawns with Annual Ryegrass. 8. Water and keep moist for 7-14 days or until the seedlings are 2-inches tall. Everything is ready: You’ve mowed down low, cleaned up your clippings and amended your soil. Now, it’s time to spread the new seed! Fill up your seed spreader and go, go, go! Make sure you follow the instructions on the seed bag, too. After you’re done, gently rake the new seed into the soil. Hopefully, your new lawn doesn’t require that much food, but it does need some nourishment. You’ve supplied the fertilizer-enriched soil when you chose Kellogg® Topper, now you need to water your lawn; do this as you normally would. Make sure to keep the soil moist for 7-14 days or until the seedlings are 2 inches tall. If you did not use a soil enriched with starter fertilizer; before you water spread some Dr. Earth® Natural and Organic Lawn Fertilizer on top according to the package directions. Now water.